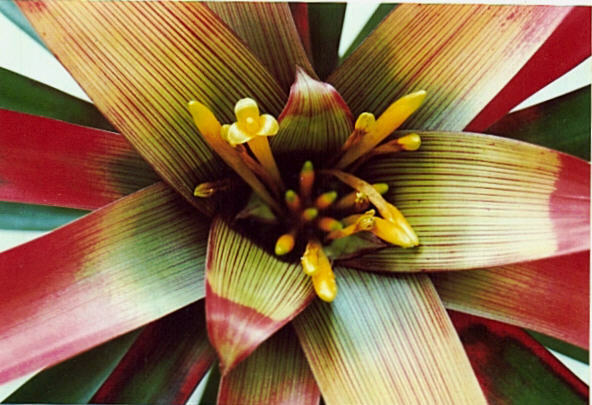 The genus Guzmania was established by Ruiz and Pavon in 1802 in honor of the Spanish pharmacist A. Guzman. The genus belongs to the subfamily Tillandsioideae, the tillandsia-like plants, and is very closely related to the tillandsias and vrieseas. Comprised of about 120 species and 20 varieties (not including collected but as yet unclassified guzmanias). Most are valued for the brightly colored bracts, a few for their highly decorative foliage. Guzmania lingulata in both large and small forms has been hybridized and has gained wide popularity with interior decorators because the plant tolerates low light and holds its flamboyant color for 6-8 weeks. Most of the guzmanias grow epiphytically, some also terrestrially, in the rainforests of northwest South America. Some species are found in Florida, the West Indies, Costa Rica, and Panama. Guzmanias grow well in bright light, without sun. Guzmanias with red or reddish leaves (G. zahnii, some lingulata hybrids) require bright light to develop good color. Their centers are kept full of water. They grow best in high humidity but tolerate drier air. Fertilizing helps them grow bigger, mature faster, and produce larger inflorescences. After (sometimes even before) blooming, a guzmania produces 4-5 or more pups. They are usually attached close to the mother plant. When a pup is 2/3 the size of the mother, press it away from the mother and downward. It will usually break away cleanly. If it does not seem possible to break it away cleanly, it is probably best to cut it out of the mother stem in order to avoid damaging the base of the pup. A mother plant which produces multiple pups may be left undivided in its pot. By the time the pups are ready to bloom (2 years), the mother plant will have died away. Form: typically a well defined, multi-layered rosette. Leaves: smooth edges, thin, acute tooth at the end, green, reddish to red; some (G. bismarckii, G. lindenii, G. musaica) are marked with hieroglyphs, resembling Vriesea hieroglyphica and V. fosteriana. Bracts: yellow, orange, pink, red, dark red to maroon, white (lingulata hybrids) usually spiralled around the scape. Inflorescence: may be nestled in the center of the rosette (G. sanguinea, G. angustifolia) but more typically borne upright on a 6+ stem covered with bracts. Flowers: small, yellow or white three-petaled, tubular with flaring petals or remaining almost closed, lasting a day. Petals are fused up to their midpoint and do not have the ligulae (upward flaps at the inside base) typical of tillandsias. A few guzmanias are night bloomers. Note: flowers of store-bought guzmanias may fail to develop due to the sudden change in cultural conditions. The bracts are unaffected and will retain their color. capsule opens when ripe, each seed equipped with a tuft of hair at its base.